For other uses, see A Song for You (disambiguation). (1971) "A Song for You"
"A Song for You" is a song written and originally recorded by rock singer and pianist Leon Russell for his first solo album Leon Russell, which was released in 1970 on Shelter Records. A slow, pained plea for forgiveness and understanding from an estranged lover, the tune is one of Russell's best-known compositions. It has been performed and recorded by an array of artists, spanning many musical genres. Elton John has called the song an American classic. One of the first versions of the song that brought it broader attention was by Andy Williams, whose single peaked at #29 on the adult contemporary chart and #82 on the Billboard Hot 100 in 1971. Ray Charles recorded a version that earned him the 1993 Grammy Award for Best Male R&B Vocal Performance. Jaye P. Morgan: the 1950s chanteuse had her final Billboard chart song in 1971 with this tune ("Bubbling Under #105). Willie Nelson: on his 1973 album Shotgun Willie. He also performed it in the 1980 movie Honeysuckle Rose, and it appears on the movie's soundtrack. Donna Summer: often sang this as the encore during tours from 1977 to 1979, and again in 1983. Several clips are on YouTube. Ray Charles: He recorded a poignant version of the song on his 1993 album My World. Released as a single, it reached #4 on the Bubbling Under Hot 100 Singles, and won him a Grammy Award for Best Male R&B Vocal Performance. Charles also performed the song at New York's Beacon Theatre on April 9, 2003, as part of Willie Nelson's 70th birthday tribute (released on DVD as Willie Nelson and Friends: Live & Kickin'). Leon Russell sang the first verse, Willie Nelson sang the second verse, and Charles sang the remainder of the song in this unforgettable performance. Nelson, who stood nearby during Charles' performance, was moved to tears. Herbie Hancock: released in 2005 with vocals by Christina Aguilera; it received airplay on U.S. smooth jazz radio and was also nominated for Best Pop Collaboration with Vocals at the 2006 Grammy Awards. The duo performed a live rendition at the ceremony that year. Simply Red: on the 2005 album Simplified and released as part of a double A-side single in January 2006. Zakk Wylde: Performed a rendition at the November 19, 2009, Gibson / Les Paul Tribute concert held at The Ryman auditorium in Nashville. Elliott Yamin: performed the song in both his audition for American Idol and in one of his final performances. It was also named number three in Entertainment Weekly's 10 all-time best American Idol performances. The song is also on Yamin's debut album. Elkie Brooks on her 2012 album Powerless. This version performed by Herbie Hancock features singer Christina Aguilera. Released in August 2005, from Hancock's 45th studio album Possibilities, the song was considered a classic cover. Aguilera and Hancock were nominated for the 48th Grammy Awards in category "Best Pop Collaboration with Vocals". 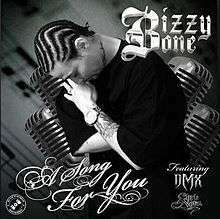 (1998) "A Song for You"
"A Song for You", which features DMX and Chris Notez, is the first official single from rapper, Bizzy Bone's album of the same name. It is sampled from Donny Hathaway's 1971 rendition. The music video for "A Song for You" included Bizzy Bone, DMX and Chris Notez; the music video includes Chris Notez playing a grand piano in front of a big manor singing his lyrics in the chorus, Bizzy Bone, DMX and sometimes Chris Notez singing in a dimly lit big room with Bizzy Bone wearing a bright red jacket and DMX wearing a copper brown jacket. Lastly Bizzy Bone is often seen in a suit singing the song in front of a tombstone, which appears to be the gravesite of rapper Eazy-E.
↑ The Encyclopedia of Country Music, 2012: "In 1970 Russell released his self-titled debut solo album, including such enduring songs as 'Delta Lady' and 'A Song for You,' both written for versatile vocalist Rita Coolidge. He followed with Leon Russell and the Shelter People (1971) and ..."
↑ "Billboard Singles". All Media Guide / Billboard. Retrieved 2010-03-01. ↑ "Billboard Chart History". Billboard. Retrieved 2010-03-01. "Why Should I Cry Over You"
"The Wind, the Sand and the Star"
"The Wonderful World of the Young"
"The Peking Theme (So Little Time)"
"Music from Across the Way"
"You Lay So Easy on My Mind"
"Since I've Found My Baby"
"It Doesn't Take Very Long"
"Your Hand, Your Heart, Your Love"
"We Have A Date (Andy's Theme)"
"The Summer of Our Love"
"You Are Where Everything Is"
"A Mi Esposa Con Amor"
"(If You Let Me Make Love to You Then) Why Can't I Touch You?"